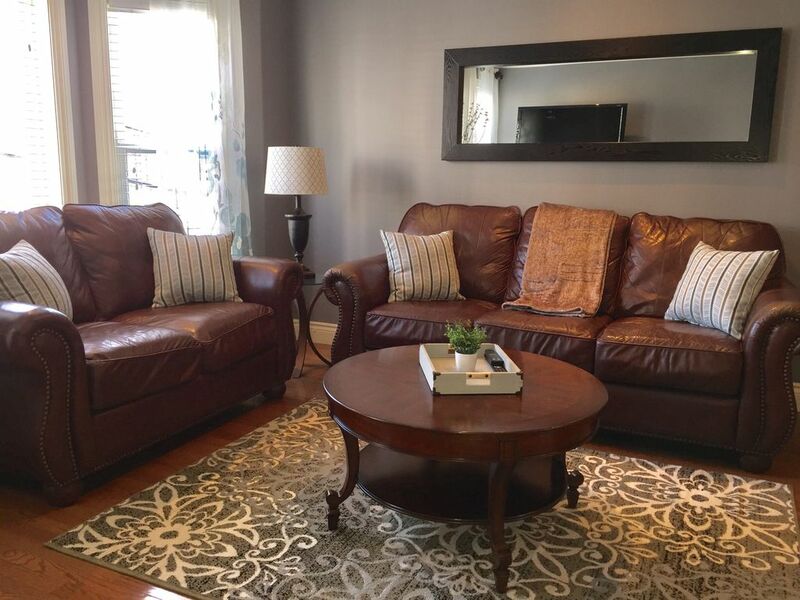 Our fully furnished home is a great place to relax in comfort and enjoy all that is St. John's. Located in the downtown core - just a short 5 min walk to downtown shopping, restaurants, and many of the great tourist attractions St. John's offers. The home is fully equipped including free wifi internet access, and cable TV. The main floor kitchen features an island and includes dishes and utensils, dishwasher, microwave, fridge, stove, toaster and electric kettle. Also included on the open concept main floor is the dining room with a table that seats 6. The living area features a comfortable seating area and includes a large TV and electric fireplace. Upstairs are two bedrooms and the bathroom. The master bedroom has a queen bed and also includes cable TV. Off the master bedroom is a walk-in closet. The second bedroom has a queen bed with dresser and closet. The bathroom features a tub and separate shower. All linens and towels are provided. The upstairs also has a small laundry room with a washer and dryer. Guests will have access to free off-street parking (accommodates 1 small car or 1 small SUV). There is a large back deck off the kitchen, which leads to a fenced garden. Very clean and perfect location! Great spot! We found the house to be very clean and located in the heart of downtown St. John’s. Walkable distance to all restaurants and bars in the downtown area. Kevin and Erin were very accommodating during our duration in their home, and very quick to respond to inquiries. Would definitely recommend this location to someone visiting the capital city! We rent apartments/houses all over the world and this is one of the best! We had a wonderful stay in St. John’s mainly due to this house. The location is perfect...right behind the Delta and less than 5 min walk to the conference centre. There are two beautiful bedrooms, master has walk in closet and flat screen TV with Bell. Beds are very comfortable. The bath is well appointed with a soaker tub and separate shower. The kitchen is well equipped. The living room has a fireplace and flat screen TV. There’s a washer and dryer and back deck. All the amenities of home. The bonus was a lot of things were supplied, which is very nice for the weary traveler. Laundry soap, dish soap, bath soap, etc....even bottle water and local chocolate bars. The hosts thought of everything to make the stay perfect!! Kevin was our main contact and he responded immediately when we had a question. There were no issues at all with Kevin or the accommodation. The only point i will make is this house has three levels so may not be the best for anyone with mobility issues. Thanks again for a wonderful stay! Place and location was excellent. Accommodation was very clean and location was excellent. Amenities close by and everything was as described. Could use larger towels or supply laundry soap to wash the small ones provided. Also a few throw blankets to curl up on the couches would be beneficial. Would definitely recommend to others to stay here especially if they have business downtown. We stayed here while I was as a conference at the convention center. It was so close I walked everywhere downtown. It was a clean and comfortable stay. If I'm ever back in St Johns I'd say here again.